Premier of Nevis, the Hon. Joseph Parry and the residents of Nevis celebrated the return of LIATâ€™s flight to the island, in a grand ceremony at the Nevis Airport on Monday, December 1st. Due to the personal intervention of the Premier of Nevis, assisted by the Nevis Tourism Authority, LIAT began their Dash 8 service of Flight #507 departing Nevis daily at 1:50p.m for Antigua. This flight now makes it possible to connect with flights to the region and the U.K directly from Nevis. After intense negotiations with LIAT executives, Premier Parry and his delegation came away with the assurance from LIAT that they would not leave Nevis stranded and that something could be done immediately.Â When flight #507 touched down 5 minutes early on Monday, December 1st, it showed that LIATÂ held to their word and are committed to providing exemplary service to the people of Nevis. Premier Parry thanked the LIAT team for their prudence and consideration for the island of Nevis. 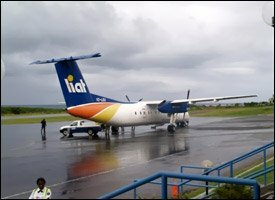 â€œThe LIAT flights will ensure a more attractive connection to Nevis that will assist greatly in drawing the British and Regional tourism market,â€ said Premier Parry. During the ceremony, the invited guests were entertained by the Methodist Melodies Steel Pan, as well as Nevisian calypsonian, King Meeko, singing his all time patriotic hit, Nevis Nice. Master of Ceremonies, the Permanent Secretary in Tourism, Mr. Tyrone Oâ€™Flaherty gave a fascinating brief history of LIATâ€™s involvement with Nevis.Â He named Ms. Janet Grell Hull and Mr. Arthur Evelyn as being the first agents for LIAT.